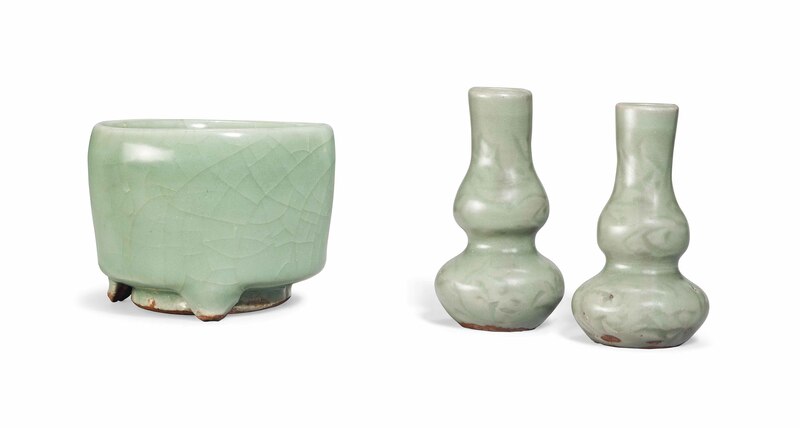 The double-gourd vases are each carved with a lotus pattern and are covered in a thick celadon glaze. The tripod censer is of cylindrical form and is covered in a thick sea-green glaze. The vases 3? in. (8.5 cm. high); the censer 3 in. (7.7 cm.) diam. Sotheby's London, 5 November 2008, The Carl Kempe Collection, lot 569. Bo Gyllensvard, Chinese Ceramics in the Carl Kempe Collection, Stockholm 1964, pls. 131 and 150.